We took a last minute decision to head up to Chiang Rai. Initially Chiang Mai was our favoured destination in the north, but due to some time pressures, we got off the sleeper train and onto a four hour bus. And we quickly fell in love…. Chiang Rai is the quiet city that we thought Chiang Mai would be. Alot of writers rave about Chiang Mai, and it’s even recently been voted the best city in Asia. But with popularity has come an influx of tourists and ‘digital nomads’, meaning Chiang Mai now feels like a busy suburb of Bangkok. Chiang Rai however, oozed small-town charm. Perfect for us countryside loving bumpkins! The streets were easier to cross, the cafes quieter and the feel more laid back. The roads on the outskirts seemed to lead out into the jungle, and the whole place felt looked after and cared for the way a rural city should. According to this list, Chiang Rai is only the 30th most populated place in Thailand, much lower than we expected given its convenient location on the main road up to the Laos and Myanmar border. This might explain the small-town feel! If you’re looking a city that’s a bit more quiet and laid back, Chiang Rai will be perfect for you. 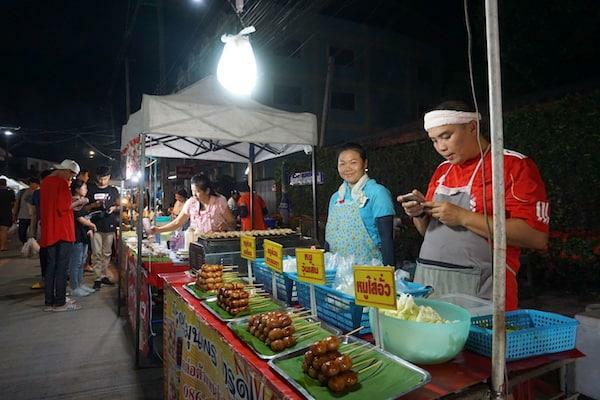 Chiang Rai’s night market was not only one of the highlights of the city, but one of our favourite places in the whole of Thailand. After browsing the stalls of wooden animals, traditional clothing and beautiful artwork head to the very back, where you will find an area of yellow tables and chairs surrounded by food stalls. This seems to be where the locals eat, and you can understand why! Cheap, perfectly spiced food, beer by the gallon (they’ll even but a pump on your table if you want it!) all accompanied by Thai music and dancing on the main stage. 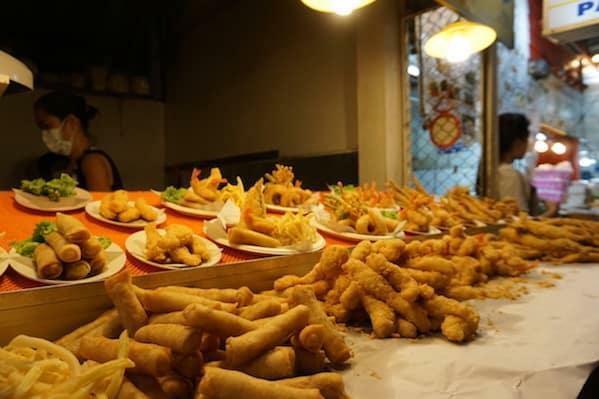 Pick and choose your favourite foods from the various stalls and grab yourself a table. Our favourites were the spring rolls, chicken & cashew and green curry. We barely saw another tourist here, most preferring to head back to the western style cafes on the main streets. Don’t make the same mistake, sit back, enjoy the show and do a bit of people watching whilst eating some of the best food in Thailand. 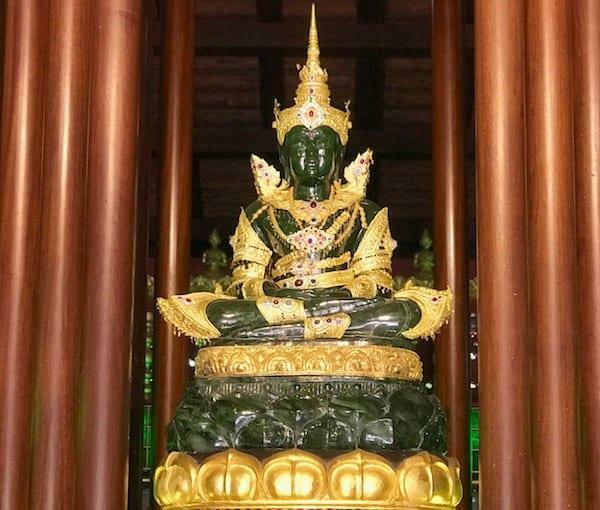 The Emerald Buddha is one of the most famous and sacred statues in Buddhism. It was discovered in Chiang Rai in 1434, reportedly after a lightning storm cracked a Chedi and revealed the Buddha statue, covered in plaster. It has since made an epic 300 year, 1000km journey via Chiang Mai, Luang Prabang and Vientiane. He now lives in Bangkok, on the grounds of the Grand Palace, a place we really didn’t enjoy. This makes it incredibly accessible to bus loads of tourists, so the standard Emerald Buddha experience is from a distance, behind a mass of people. No such problems in Chiang Rai. The original temple has a replica, which to the un-trained eye is identical to the real thing (it was intentionally made 0.1cm shorter so as not to be a complete copy, but you’d have to be an obsessive to notice!). 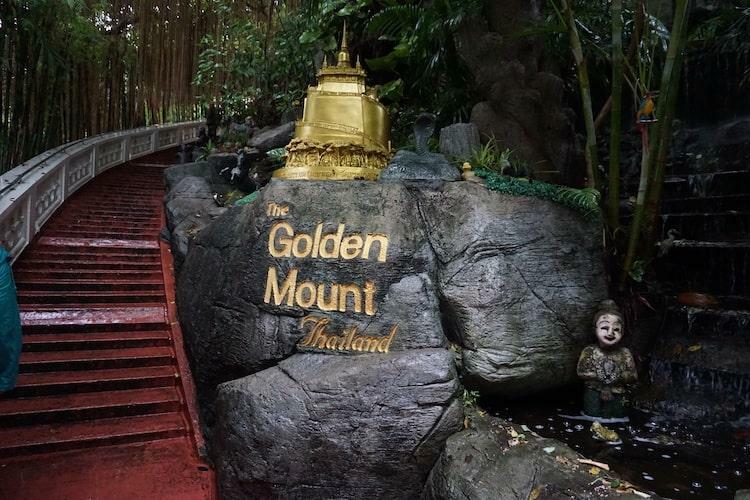 Unlike in Bangkok, you’ll be able to get close, and appreciate this beautiful icon of Buddhism fully, and likely have the temple completely to yourself. When you first see Chiang Rai on a map, it would be easy to assume it’s a sleep town with nothing really to see. Head out for a walk around town, and even without a map you’ll find something interesting to keep you occupied. From colourful Wats, informative museums and vibrant markets. But if you’re willing to venture a bit further afield then Chiang Rai has three colour-themed delights to throw your way. 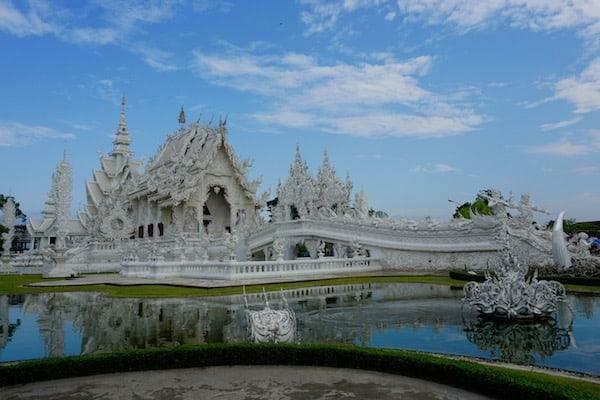 The White Temple, Black House and Blue Temple are all within a 15 minute drive from the centre of Chiang Rai and all deserve much more written about them that this small section of an article. The White Temple is the most beautiful, the Black House the most intriguing and the Blue Temple the most accessible. If you can, get there early on a private tuk-tuk to beat the crowds. 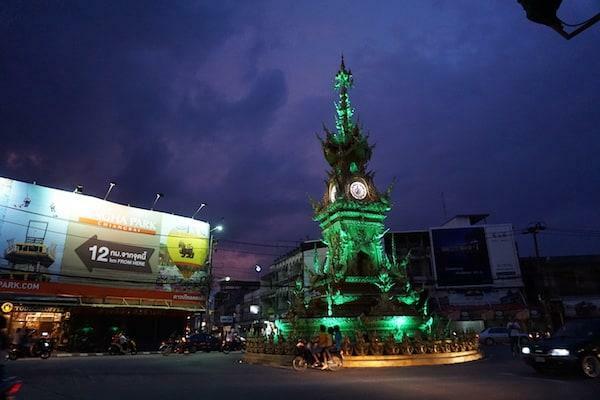 Visit Chiang Rai’s golden clock tower at 1900, 2000 or 2100 and something rather unexpected will happen. I won’t ruin the surprise, but the photo above might just give it away! Chiang Rai is perfectly located to get out into some less-visited spots in Thailand. 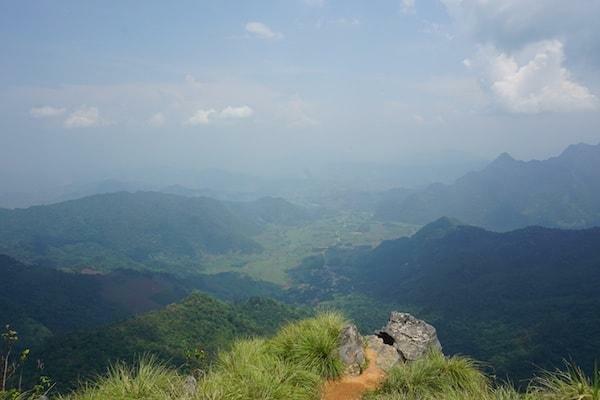 The incredible viewpoint of Phu Chi Fa, where you can witness the sun rise above the clouds. Drives along the mighty Mekong River. Mae Fa Luang Botanical Gardens. 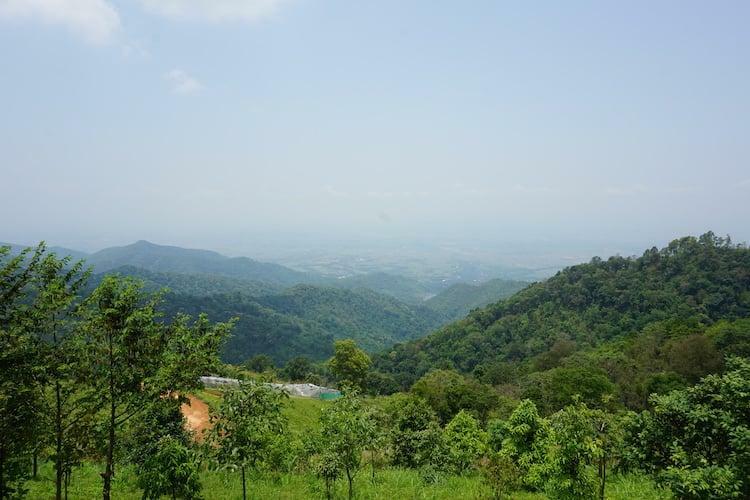 The roads further north are fairly quiet, and it is a great way to get off the beaten track and experience Thailand at your own pace. For more information check out my article Chiang Rai Road Trip: 3 Day DIY Tour of Northern Thailand. Maybe we were getting a bit home sick, but the Cat ‘N’ A Cup Cafe became one of our favourite hang-outs in Chiang Rai. 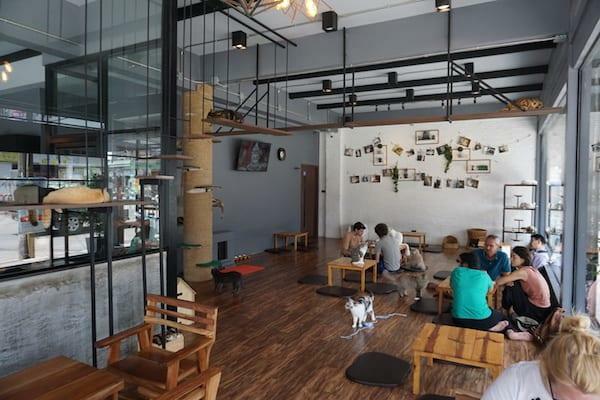 This epitomises Chiang Rai’s laid back feel, set in a light, modern building, with low tables and great coffee – oh and one or two cats hanging about! Studies show that owning a cat can cut stress, so being surrounded by this many must have been good for our blood pressure! It’s not for everyone, but for cat lovers like us it was a timely reminder of home, and a chilled out place to lose a couple of hours. The truth is it can be hard to put a finger on one thing that makes you fall in love with a place. Maybe it was the friendliness of the people at the two guesthouses we stayed in over a 10 day period. 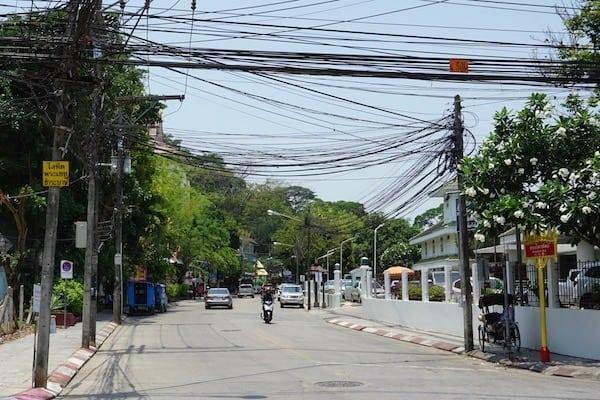 Maybe the quiet streets, a big difference from other cities in Thailand. Maybe something else. How easy it was to get washing done. How the town was big enough to have entire rows of shops selling chainsaws, mattresses and mopeds, but still feel small. How everyone seemed to smile when they caught your eye. How all the coffee was grown locally. How the tuk-tuk drivers didn’t seem to try and scam you. The truth is it was probably a combination of everything above. What is certain though, is that we fell quickly in love with this leisurely city, and we’ll be back just as soon as we can!